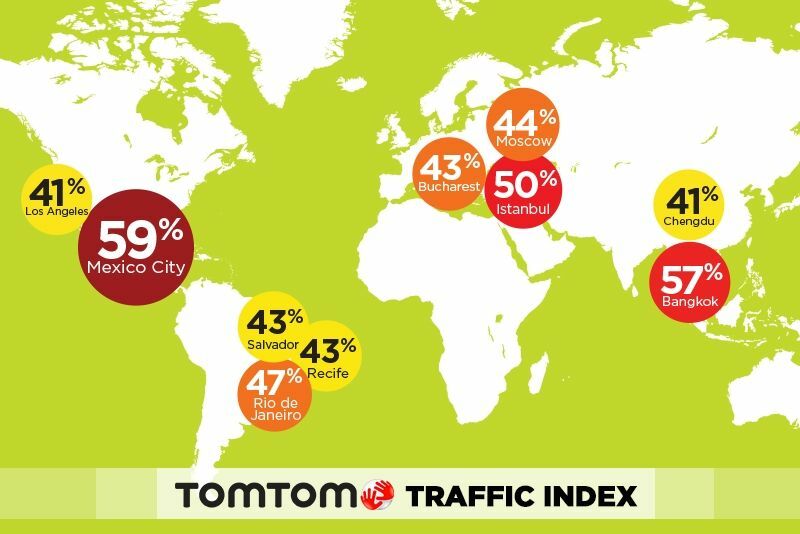 TomTom Traffic Index 2016 study which takes data from last year, confirmed Bangkok as one with the worst traffic jams in the world. The study revealed that drivers in the Thai capital spend on average 57 per cent extra travel time stuck in traffic any time of the day. It gets worse in the mornings, when Bangkok drivers spend up to 85 per cent extra time in traffic, while in the evening peak period that slows even further to 114 per cent. 5. Moscow – 44 per cent. 295 cities across 38 countries in the world were measured by the Dutch navigation firm. “The TomTom Traffic Index is released every year to help drivers, cities and transport planners to understand traffic congestion trends but, most importantly, how to improve congestion globally,” said Ralf-Peter Schaefer, VP of TomTom Traffic. “We really want everybody to think about how they can lower the amount of time they waste in traffic every day – and to realise that we all need to play a part. We can work together to beat traffic congestion,” the VP added.